Dodge is DESPERATE to get rid of Challeneger SXT models, you can lease from 3K down and 159 per month over 3 years or any combination of those figures. I just got one and think its so great of a deal. I can’t post on here. Hi all. I have been following deals on this site for a while and think it is great. I found a website on page 50 of my google search results called theleasedeal.com. Wondering if anyone had used it and if so whether the deals are legit? It seems pretty functional but only appears to cover the so-cal la market. Hello first time here. I am trying to find the new user interactive tutorial which is not easily found. Wish me good luck, and I will then post my porsche lease result! Edited to earn the badge! Hello, not sure if this is how to post but I’ll try. Haven’t finalized yet, have deposit down to hold. 0.00182 MF, this is for ‘19 40i Msport. This is after a few go rounds with sales manager, but from what I’m seeing here is still too high. What am I missing? Seems like purchase price I’m paying is still too high, dealer cites brand new model as inability to discount more. Any help is truly appreciated! Thanks. hello! i am looking to lease a toyota rav4 in Los angeles and this is my first time ever having a car! i wanted to get some opinions on a deal i found recently. please see info below ive gathered so far! I’m new here and don’t know how to post. Any help appreciated so I’ll do it here right now. 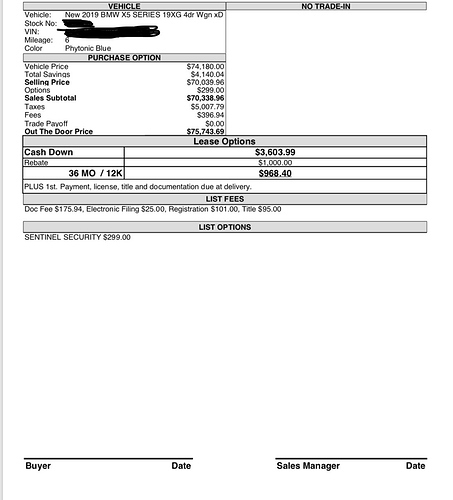 Signed yesterday, lease for Honda CR-V LX AWD. 36m/12k/y, $25650 MSRP, $290/month (tax included). I payed only for the first month at signing. Greater Chicago Area. Can we post pending deals that are not signed yet for feedback here? How did I do? 2019 Kia Stinger GT2 AWD Ceramic/ Red interior. Money factor should be the same. Not sure on the 36 month. Last I checked it was around 6k. If you shop around and get pricing from multiple dealers, you’ll most likely find one willing to deal and get the price youre comfortable with. 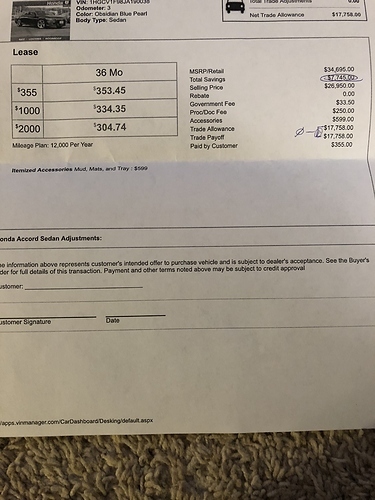 Thank you how did you get 8,200 in rebate tho if u don’t mine me asking I currently have a 15 optima…and that lease is up at the end of March I was told I would get loyalty credit…is that where u get the extra 2,200?